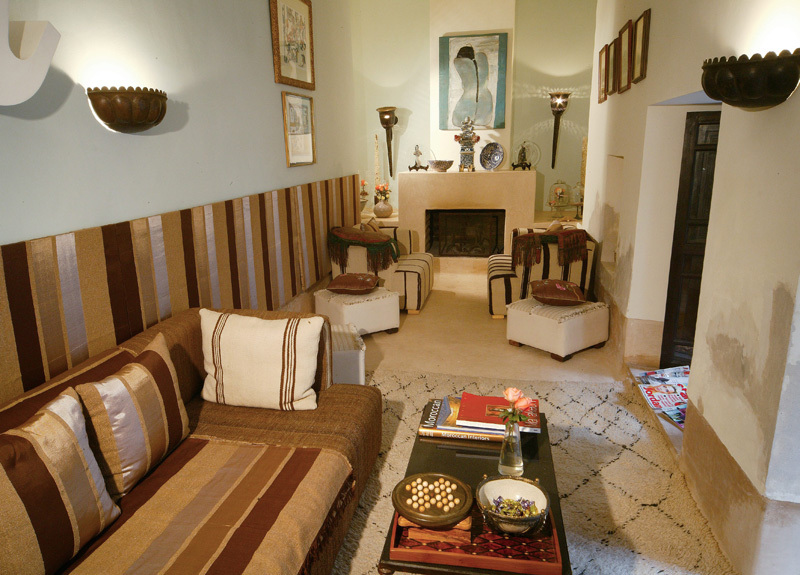 Dar Charkia - Luxury Riad in Morocco. 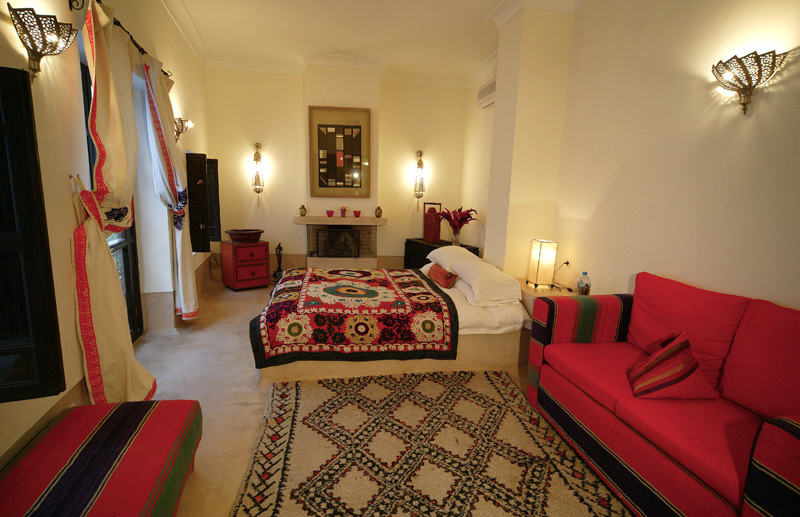 Book Dar Charkia Today with Hip Morocco - Holiday Accommodation in Marrakech, Morocco. 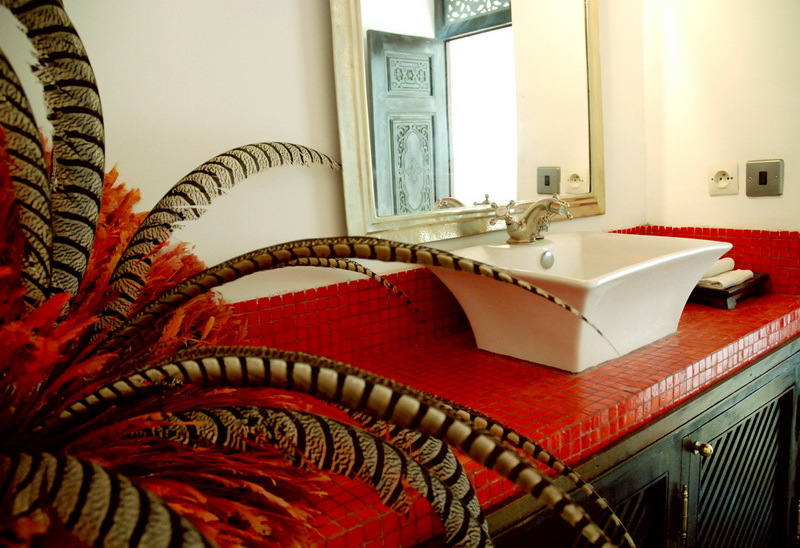 "The moment you cross the threshold, the gentle atmosphere envelops you.."
Dar Charkia is a luxury guesthouse based in the heart of the Marrakech medina. Finished to the highest specifications of comfort, Dar Charkia’s style blends an enchanting mix of Asian design and African aesthetics. Located only 50 metres to a road access and taxi drop off point and steps away from many of Marrakech's finest restaurants and the sights, smells and sounds of the renowned Place Jmaa el Fnaa, this riad is situated in a quiet corner of Bab Doukkala and functions as an oasis of calm amidst the vibrant cacophony of the Marrakech medina. Each of the individually decorated suites feature an en-suite bathroom, air-conditioning and heating, and many with their own fireplace. Dar Charkia has many quiet corners where guests can relax: the riad’s extensive roof terraces offers stunning views of the seven mosques of Marrakech and the Atlas Mountains, alternatively the pool in the patio acts as the perfect space to unwind after a long day negotiating the souks. Guests can also enjoy a massage in the privacy of your own room. 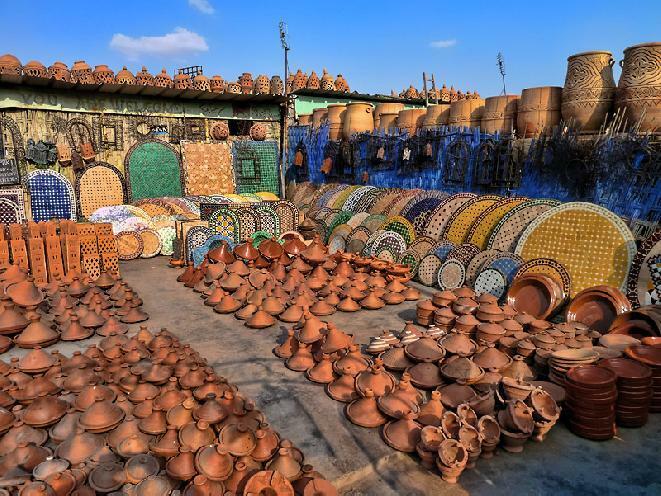 Marrakech is many different things to different people, but whatever you are hoping to experience here, Dar Charkia is the perfect base to discover the secrets of red city. Moroccan food is often described as some of the best in the world, and the authentic delights on offer at Dar Charkia will not disappoint. Breakfastis a lavish but low-key affair, where guests are treated to an array of delectable goodies. The chef's mouthwatering offerings include homemade pancakes, fresh fruit salad and a range of light pastries. 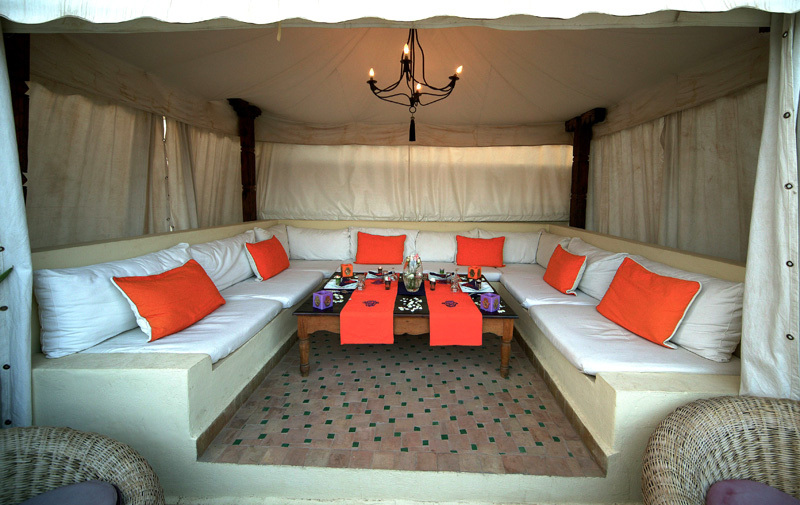 Lunch and evening meals are no less impressive, offering a fantastic fusion of Moroccan and European cuisine. Specialities include carrot, cumin and coconut soup; coriander and sweetcorn cakes; vegetable terrine with pear; lamb tagine with prunes; and chocolate tart with baked fruit. Meals can be taken either in the dining room, the courtyard, in the Pavillion tent, or on the wonderful sun terrace overlooking the city. A selection of fine imported wines, locally produced beer, water and soft drinks are available. The riad owned by Pierre Balmain and now converted to a traditional moroccan restaurant with live music by the pool in the evenings. A fusion of Italian and Moroccan food just a 5 minute walk through the medina from Dar Charkia. Open for lunch and dinner with a great roof terrace. All day restaurant with clean WC! Lovely individual pergola dining rooms and tables exposed to the sunshine. Jardins de Bala, the great Indian restaurant on the roof terrace of the Jardins de la Koutoubia hotel. 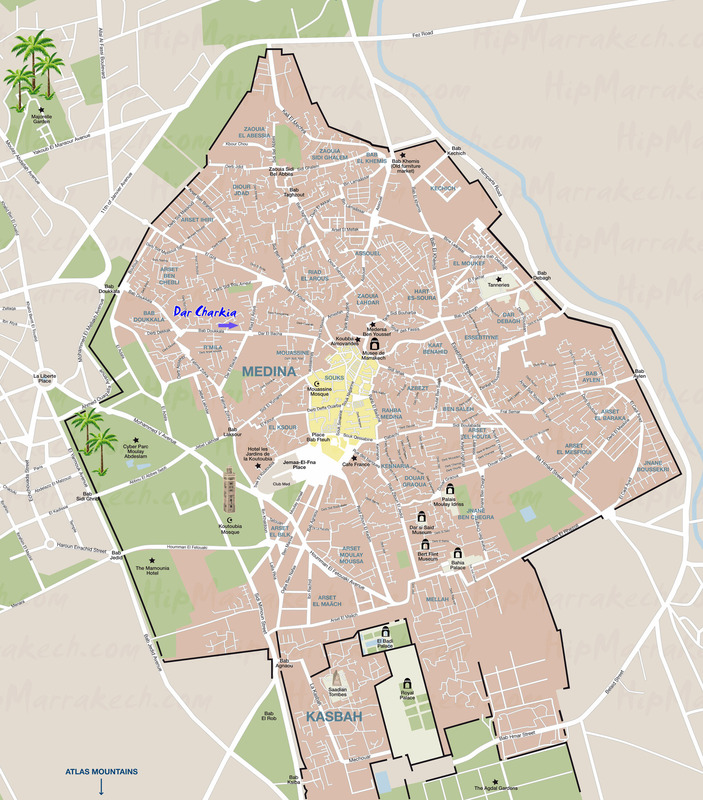 There are many interesting and important landmarks within easy walking distance of Dar Charkia. For instance the Riad is 1 minute from the Palace of Dar El Bacha, 3 minutes from Dar Donab where the last of the Gnaoui kings resided, 8 minutes from the Museum of Marrakech and Medersa ben Yousef, the koranic school and 4 minutes from Cafe Arabe and Terrasses des Epices where you can get a lovely long cool drink and watch the sun go down over the roof tops of the medina. 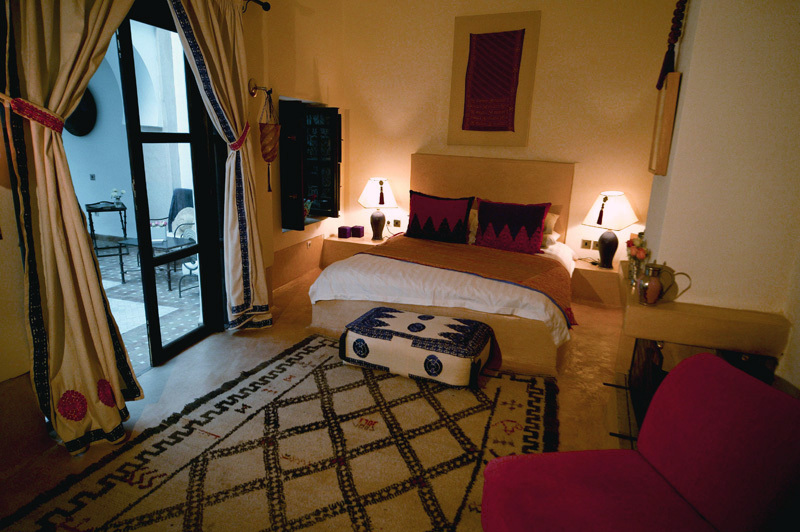 Dar Charkia is a 6 minute walk from the world famous Jemma El Fna and all the hustle and bustle that it has to offer, but located far away enough to enjoy the calm and tranquility of the surroundings of the riad. There is a local communal oven nearby, with smells of homemade bread and pastries wafting through its front door, the famous home of furnishing emporium of Mustapha Blaoui whose pieces have decked most pages of many Conde Naste publications, a great local barber and 6 minutes walk from the great roof top restaurant Jardins de Bala overlooking the main square. "Excellent place to stay. Beautiful inside and very peaceful. The staff can't do enough for you and you are treated like a king. We went for four nights as a birthday present from me to my wife. Marrakech is a mad, mad place, everyone should visit it though because the people are generally wonderful. It is amazing. 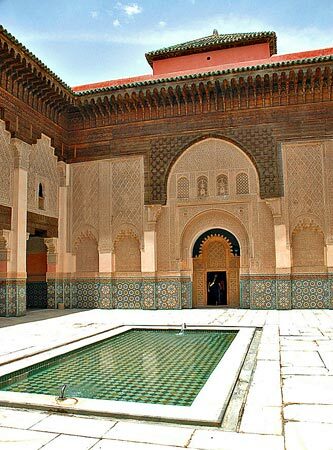 You must stay in the medina if you really want a feel of the place." 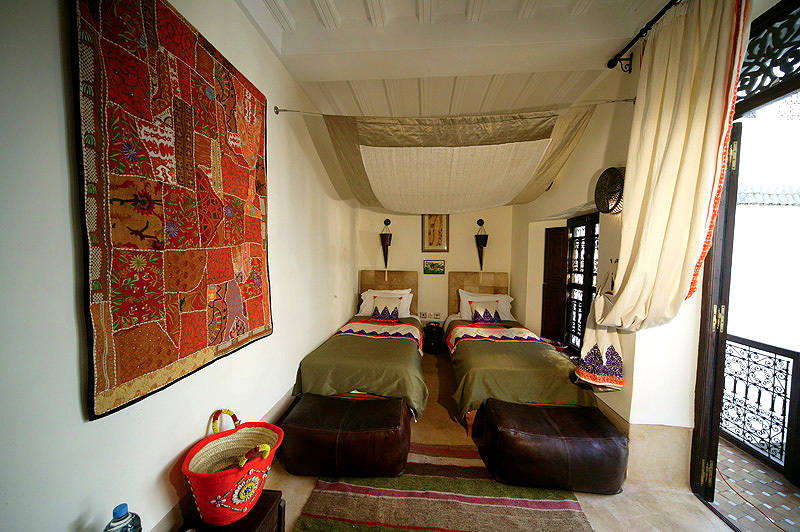 "Have seen and stayed in quite a few Riads in Morocco, Dar Charkia has to top them all. 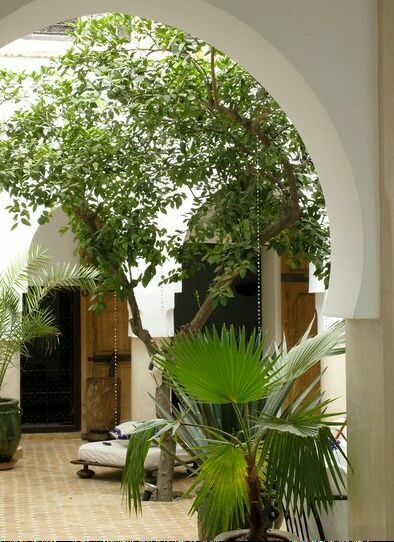 In perfect location down a charming street, the Riad is an Oasis in the Medina. The staff are all excellent, really friendly and always on hand to make my stay an excellent one. The food is delicious, breakfast varied with some great dishes every morning. It was a great start to each day." "rrived at this beautiful rhiad to be met by the welcoming owner and his fantastic staff. Rooms were lovely with everything you could possibly need. The food we received on the first night was amazing. Breakfast every day was extremely varied and tasty and there was so much of it you really did not need to eat for the rest of the day. Michael was very informative and gave really useful information on everything. We were treated as part of the family and everyone was fantastic. We were emailed with details about trips booked, taxis booked, shopping, restaurants and everything else that we needed to know. This is an exceptional place which I hope to return to very soon." 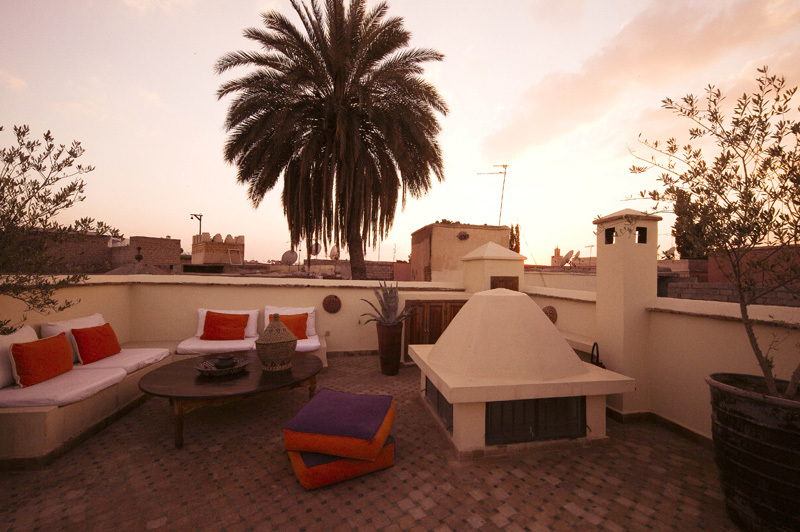 "The riad was great, it was especially good to have an English owner who gave us a brief talk when we arrived and booked us restaurants etc and giving us tips on what to do, how much to pay/tip etc. The interiors were lovely, the service was great, our room was beautiful and we really enjoyed ourselves, I would say it probably met (the photos on your website were very good) or exceeded our expectations. I have since recommended both your website and our riad to a number of friends." "This is simply an amazing place to stay. 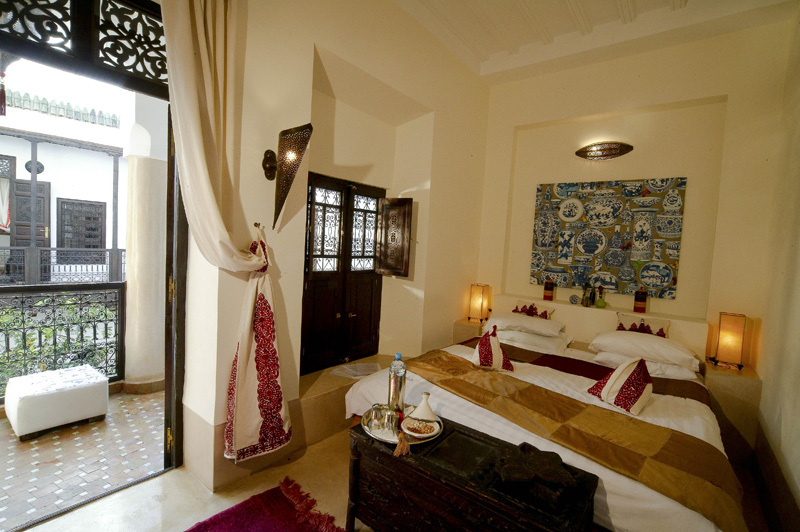 The Riad is superb, breakfasts are outstanding and the staff cannot do enough to help. Owners Michael and Lisa are incredibly helpful and knowledgable and you can't go wrong if you take their advice. 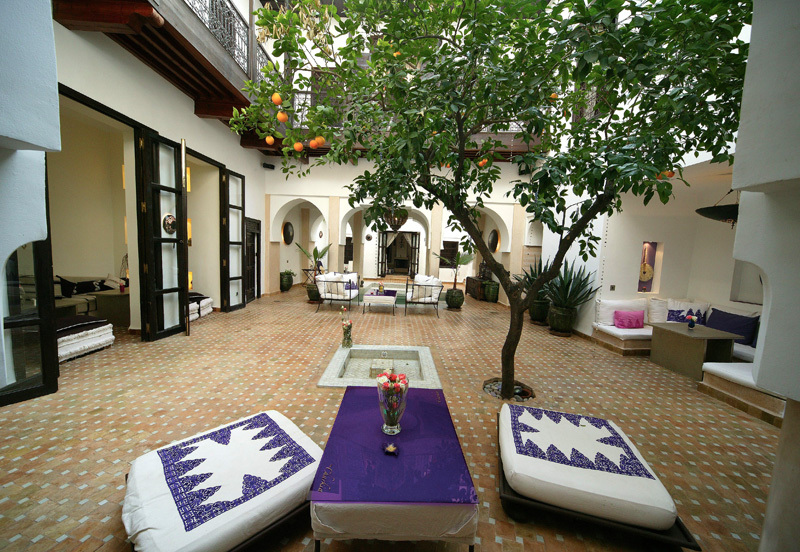 If you're looking for somewhere to stay in Marrakech, this is the place to choose. We have travelled the world and this has to be one of the best places ever. Just perfect." Dar Charkia is located in the well-known Dar el Bacha antique dealers district close to the Bab Doukkala mosque, which is one of the smartest areas within the Medina in Marrakech. Dar Charkia is situated only steps away from road access and guarded parking, via a wide, well lit pedestrian street. A Double Suite individually styled with en-suite bathroom, fireplace, air conditioning and heating, and safe. Room features: En-suite bathroom, fireplace, safe, air-conditioning and heating. A Double Suite located Poolside at Dar Charkia, individually styled with en-suite bathroom, fireplace, air conditioning and heating, and safe. A Double Suite individually styled with en-suite bathroom, air conditioning and heating, and safe. A Double Suite individually styled with ensuite bathroom, air conditioning and heating, and safe. A Twin Suite individually styled with en-suite bathroom, air conditioning and heating, and safe. An individually styled Master suite with separate sitting area, en-suite bathroom, fireplace, air conditioning and heating, flat screen satellite TV/DVD and safe. 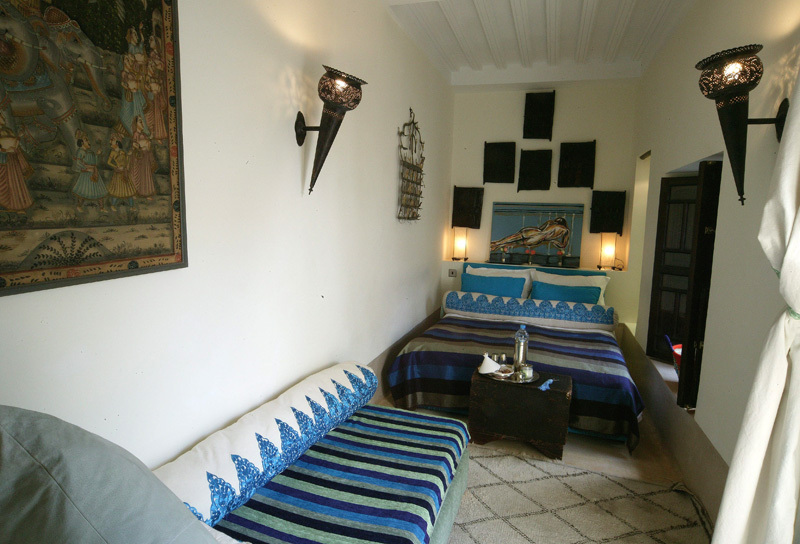 Dar Charkia is available exclusively, with use of the elegant Master Suite, four individually styled Double Suites, and one Twin Suite, accommodating up to fourteen guests. 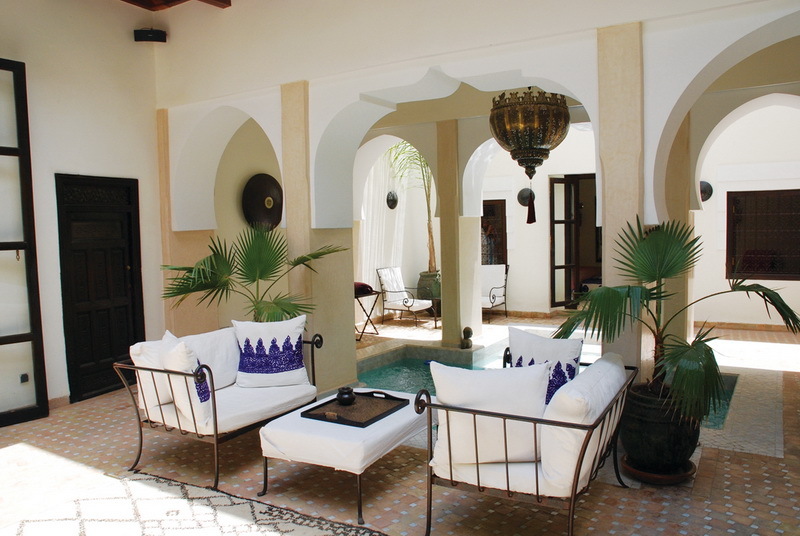 The base rate price at Dar Charkia is in pounds, euros, or Moroccan dirhams and exchange rates are approximate.